The inner end of Whale Cove is defined by an immense barrier bar, separating the lagoonal barachois from open waters of the bay. Walking along the bar on an unseasonally hot summer day, you are struck by the fact that many of its constituent stones are geologically rather similar. 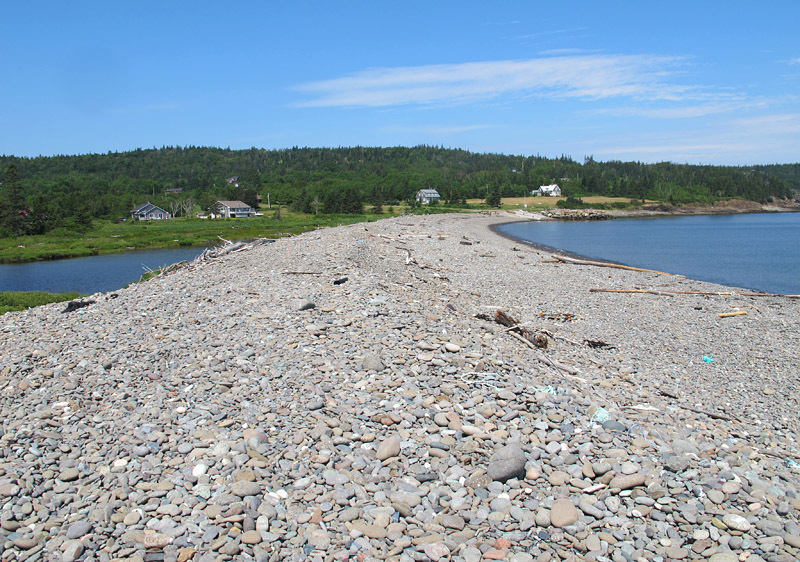 Unlike some beaches elsewhere on Grand Manan, which contain a great diversity of rock types, the bar is largely composed of pebbles and cobbles of basalt. The source of much of the basalt in the Whale Cove bar is easily determined. Northward, either side of the bay’s mouth is lined with cliffs. Ashburton Head on the western horizon is particularly impressive, and in front of it are the layered flows of the Seven Days Work. Basalt, almost as far as the eye can see! These rocks are all part of the uppermost Triassic Dark Harbour Basalt. Layered basalts form the Seven Days Work, with Ashburton Head on the horizon. Much of the basalt in the bar is of a mid grey colour. Wet stones by the sea look black, but in the midday sun the round cobbles higher on the bar are bright and pale. The beachcomber’s eye is drawn to any that stand out from the background grey: each occasional piece of white quartz or pink granite is picked up and examined. 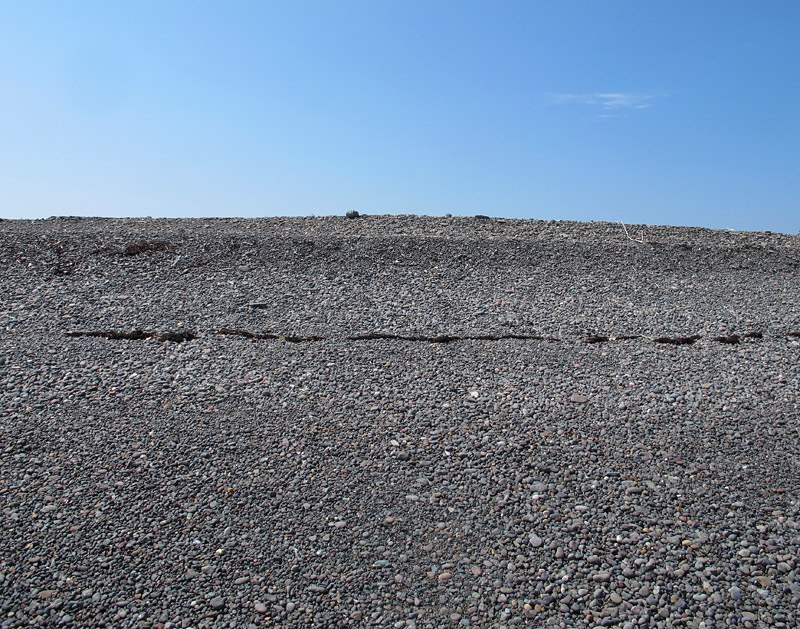 Visiting Whale Cove last summer, we stumbled upon a couple of striking black stones. These are still basalt, but they are much deeper in colour than the thousands of rounded basaltic clasts that surround them, and they seem to take a finer, smoother polish. The geologist in me asks where these different stones might have come from. The obvious answer is that they were derived from one of the many layered lava flows in the Grand Manan area, such as those that make up the Seven Days’ Work. But what if it isn’t that simple? What if they came from somewhere entirely different? 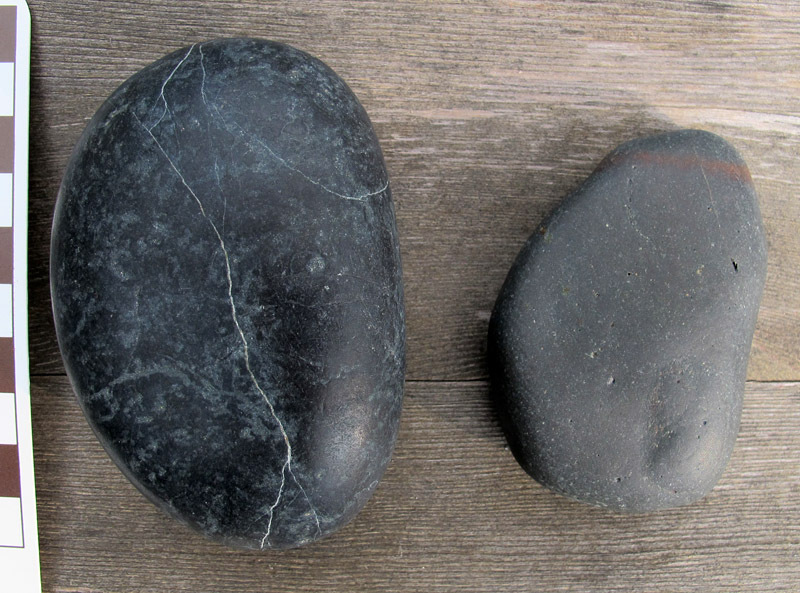 The dark stone on the left is quite different from the more typical Grand Manan basalt on the right. Let’s digress for a moment. The determination of provenance, the source of any geological material that is no longer connected to bedrock, is often difficult. In the case of Whale Cove I was merely curious about where the different basalts may have come from, but there are many instances where determining the provenance of transported materials might tell us where an unusual fossil deposit is located, or it might help us to find a rich diamond pipe. It is easy to assume that the obvious answer is the correct one, but that is how mistakes can be readily made. Once, doing research along the shore of Hudson Bay near Churchill, we found a lovely horn coral in a loose cobble, a fossil that was different from those in the nearby bedrock. The cobble’s colour and texture were similar to those of the bedrock, and we were excited to add this species to our list of what occurred there. But then it clicked: this fossil was substantially older than those we were collecting at Churchill, and had in fact been originally located on Southampton Island or somewhere else far to the north. 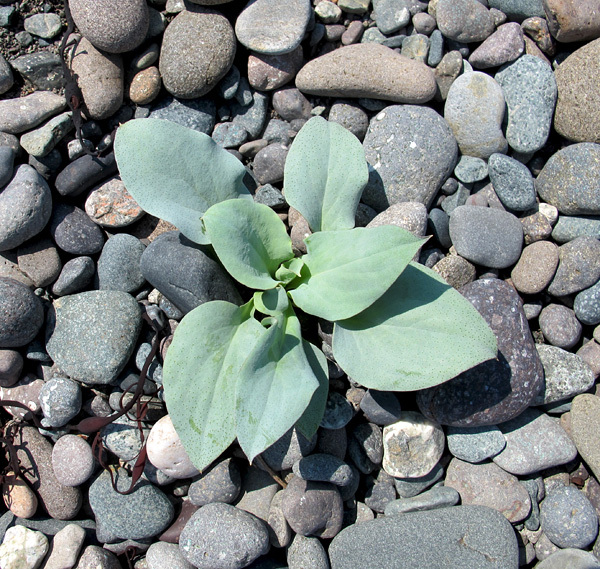 Its cobble had been transported to the Churchill area by the Ice Age glaciers, leaving it in a place where it could be incorporated into a beach where most other stones were more local in origin. And so it might be for the dark stones at Whale Cove. Maybe they were moved there from somewhere far to the north, since New Brunswick was also glaciated. Or maybe large waves had transported them from somewhere offshore; certainly there is very good evidence of storm waves that would have the power to do this. There is a third possibility that is quite intriguing. Ashburton Head is so named because the barque Lord Ashburton was wrecked there in 1857. This was a terrible tragedy: the ship was driven onto the rocks by hurricane-force winds, with the loss of 21 lives. The Lord Ashburton had previously been an immigrant ship, transporting people to many different parts of the world. Sailing ships carried a load of ballast stone in their hulls, to counteract the force of the sails, and dense rock such as basalt was generally selected. It so happens that the Lord Ashburton carried dark stones as ballast, and these can be found in the beach at Eel Brook Cove, by Ashburton Head. That cove is only 2.5 kilometres along a straight shore from Whale Cove, and it is entirely possible that waves and currents have transported some of the stones over that distance in the 157 years since the ship was wrecked. 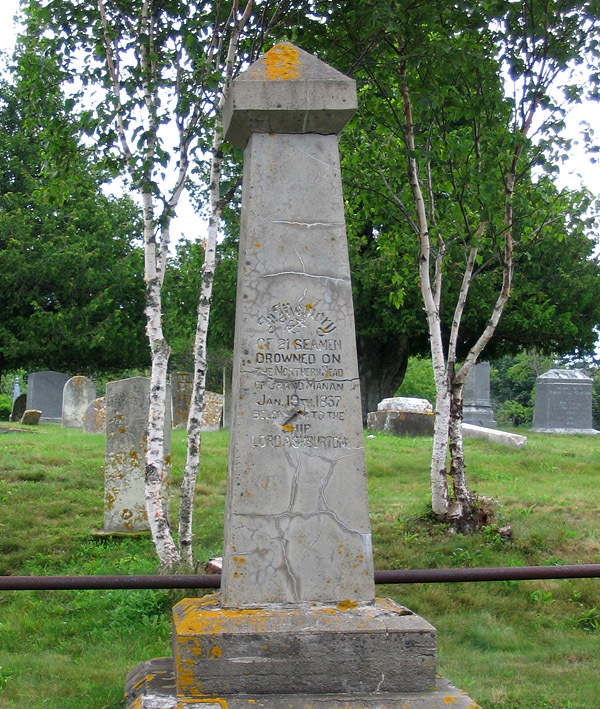 The dead from the wreck of the Lord Ashburton were buried in the cemetery at North Head, Grand Manan Island. If the stones did come from the Lord Ashburton, then that would just make the provenance question more complicated, rather than answering it. If they were ballast on the ship, then maybe they were picked up on a voyage to some far corner of the world, perhaps in Australia or the Mediterranean or Ireland. It would be a bit more prosaic if they were part of its original ballast, however. The ship was built in St. Andrews, NB, and by coincidence, after travelling all over the world it was wrecked just 40 kilometres from its birthplace (and there are also basalts in the St. Andrews area!). I’m sure this whole question could be readily answered if I was prepared to grind up the stones and subject them to a bit of modern geochemistry, but isn’t it better just to contemplate them on our Winnipeg windowsill, intact and intriguing? The post has been corrected to reflect Greg’s newer information on the age and formation of the basalts. It is nice to think that one might find pieces of Lord Ashburton ballast along that shore, even if my stones are unlikely to have that source. I will have to go back to Grand Manan very soon! ← What You See is What You Get. Sometimes. This is a very interesting and useful post. 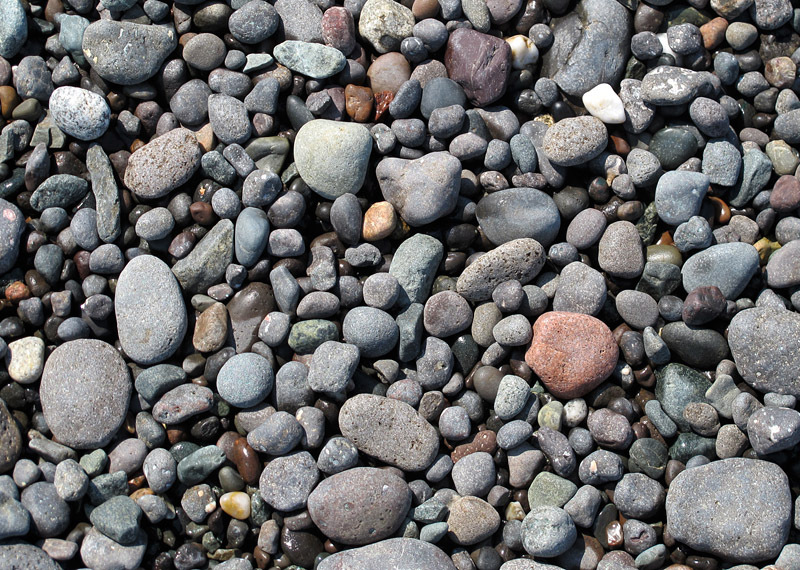 It is sometimes very difficult to determine the origin of pebbles on a beach because of events like glaciation and sea transport. Ship’s ballast was one phenomenon I hadn’t considered. 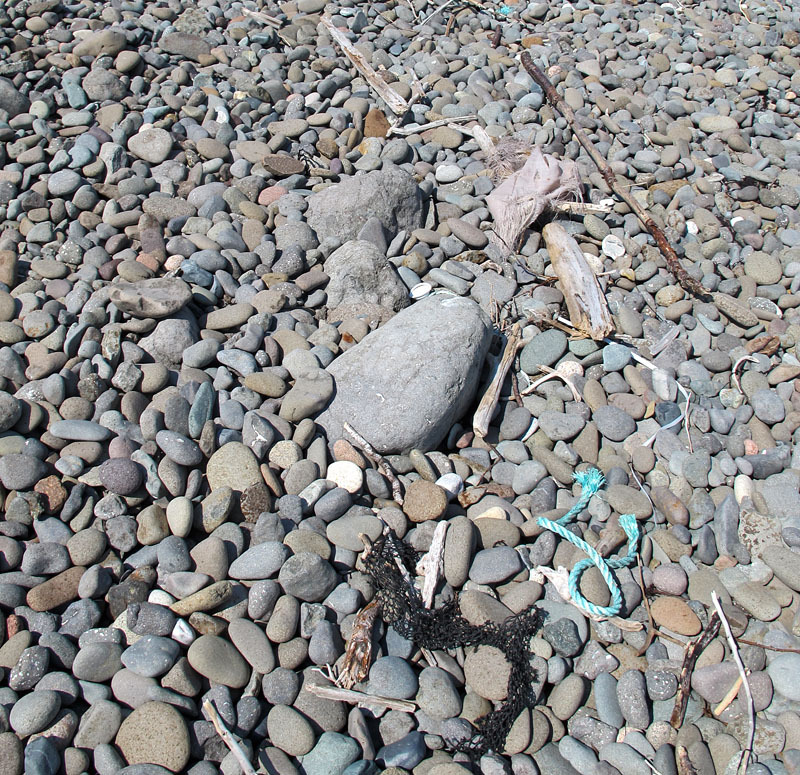 I visited Whale Cove too last summer and examined the pebbles there. Thank you, Jessica. I know you have some fabulous coastlines in Britain; I hope you found Fundy different enough that the trip was worthwhile! Fascinating story and I love the sleuthing involved in determining the origins of the fine-grained black basalt. History gets thrown in too! Thanks for the vicarious travel. Kate, many thanks for your kind thoughts. In 1843 my great-great-grandfather and his family immigrated to New York in the Lord Ashburton. His son noted the wreck in his farm journal; by then the family was settled in Brantford, Ontario. Not only stones are displaced! Your beach has this story for me. I always enjoy your articles — many thanks. Barbara, it is great to read about that sort of connection. There was so much interesting migration of various sorts in the 19th century, and I guess that the Lord Ashburton was involved in quite a few of those stories. Thank you for your comment. Once again you fascinate me during your travels! first question that comes to me is can the same basalt be found across the pond? And would that determine the position of Laurasia relative to Pangea during Jurassic times? Such questions were pondered by Hutton,Lyell, and Wegener so many years ago. Simply fascinating! Hi Brian, I am far from expert on Mesozoic paleogeography, but it is my understanding that the Fundy basalts were formed during the rifting as Pangea pulled apart. Fundy was just one of the unsuccessful rift basins, and the main rifting took place to the south and east. So there are quite a few basalts around the Atlantic that are the same sort of age, but they would not be identical. Those are some very lovely pictures for me. Especially because in India, I haven’t yet gone to any pebble beach and doubt if there is one. I agree that amdist the grey pebbles…anything different would for sure is eye catchy and be a part of beachcombers collection. Raastha, thank you for your kind comments. 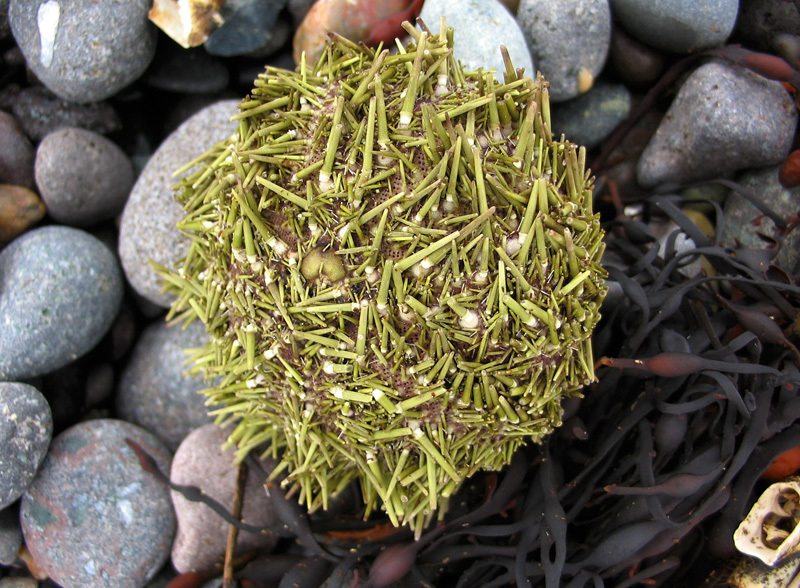 Good luck with your beachcombing! Hi Graham, this is an excellent blog and I am happy to find it! 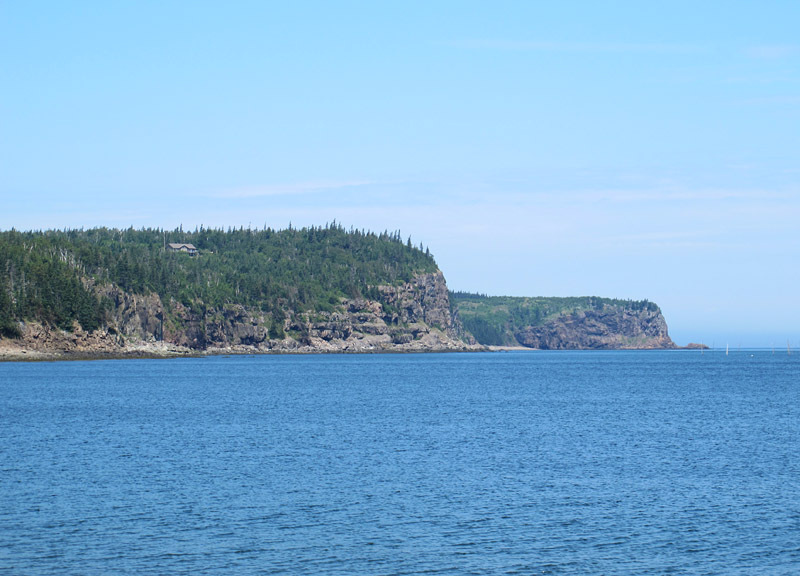 New names were recently assigned to the Mesozoic formations of Grand Manan, and we had to replace Grand Manan Basalt because the Grand Manan name had already been used, so it is now Dark Harbour Basalt. And now latest Triassic, as the Tr-J boundary has been moved from strata just below to just above the basalt. A nearly (but not exactly) identical basalt is found in Morocco, and separated from Atlantic Canada when the new Atlantic Ocean split this section of Pangaea apart. Hi Greg, Many thanks for your comments! I guess I should have run those thoughts past you before posting it, but as you know the main thing with a blog is to make people think. As this was well away from my specialty I realized that I was likely to make some errors, but it seemed like such an entertaining idea that I had to put it up there. Thanks for the update on formation names and ages – I will change that in the post. Is it OK with you if I post your comment as an addendum / correction at the end of the piece? I will also try to add a link to your excellent page when I get around to updating the blogroll. Hi Graham, sure, what ever will be helpful. Grand Manan is basalt heaven for a geologist of my interests. Thanks Greg. I can certainly understand that – from my perspective, Grand Manan is a perfect place except that it almost lacks fossils! ‘dark stone on the left’ looks like serpentinite. Hi Allen, thanks for that idea. We did examine the stone in the lab, and my colleague confirmed my interpretation that it was a basalt, at least sensu lato. However, it would be great to get an expert on that sort of rock to take a really good look at it. Hi Jane, thank you for the comment. Yes, I think there are endless possibilities for things to examine on Grand Manan!